Since running Finn Moto for the past 12 years I have been lucky enough to be apart of the transition, seeing what motorcyclist use to wear for protective pants on their motorbike. I can tell you it wasn't pretty; whether it was ugly, heavy, mad max looking leather touring pants or squishy, sweaty, bulky cordura/polyester pants, I could tell the riders weren't happy wearing it but they needed the protection, so it was worn. 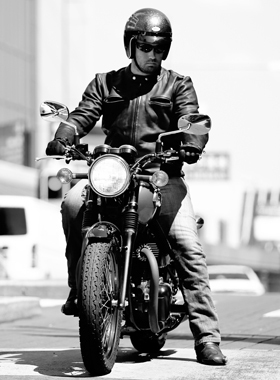 In most cases riders resorted to wearing their casual clothing such as denim jeans & cotton jackets. Thankfully with the material & technology we have today its given the option for fashionable protective motorcycle wear such as Kevlar Jeans & Kevlar Jackets / Hoodies. Riders need the full protection when on the bike, yet they want to look & feel comfortable when off the bike. The combination of protective materials such as Dupont Kevlar fibre & fashionable clothing like denim jeans has quickly become the preferred choice when riding their motorcycle. Dupont Kevlar is the trusted name for aramid fibre. The company has well & truly proven itself producing a light weight high strength fibre. It regularly combs the market of sellers using its fibre and ensures sellers/brands are actually purchasing the genuine Kevlar fibre. The material can only be purchased through authorised resellers. 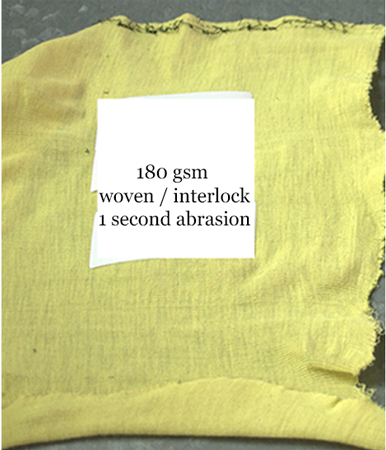 Unfortuntely Kevlar & price indicator is not enough to tell us if it will protect you, an independent study found the weave type, gauge/thickness & gsm has a huge impact on the abrasion time. Woven or Knitted? Woven has been proven to be weaker through independent impact abrasion tests because of its thin tight weave construction it rips & abrades away alot quicker than a terry loop knitted method. The terry loop construction offers a thicker gauge & has more give so it won’t snap/rip as easy providing longer abrasion resistance. Knitted allows air through providing breath-ability for comfort. The gsm (grams per square meter) is the weight/thickness of the Kevlar, the higher the number the better it is, too heavy can be quite thick/hot. Anything under 300gsm knitted should be avoided. 400+gsm is the ideal amount. 300gsm = level 1. 2x300gsm or 450gsm = level2 (note: this guide is only for knitted kevlar). The positioning of the Kevlar is equally important to the actual Kevlar used. Some brands have design rights to the positioning of the Kevlar (that’s why a lot have their own special method). From many reviews and crash testimonials we have discovered the only safe option is to have Kevlar lined front and back, waist to ankle. When you come off sliding along the ground at 60 km’s you’re not going to have time to ensure the knee Kevlar patch is positioned on your knee, in most cases the denim will twist around exposing behind the leg (where no Kevlar is positioned). The materials are only as good as the stitching that holds it together. Its best to have 1 to 2 outside stitch with 2 inside stitch (race standard safety stitch) for all major seams, front/back rise & inner/outer leg. This takes more time & care which costs more. The thread weight & material are equally important, as a guide just make sure the thread gauge is thick and a polyester or nylon. Although the denim won’t protect you, it’s important to get a colour and wash affect that suits your taste. Their is nothing worse than walking around in jeans that look like they cost $5-$10 with Kevlar sewn in them. For maximum comfort you need soft touch & prewashed denim in the weight of 10oz to 13oz. You will find Kevlar Jeans available in a variety of cuts such as Skinny, Slim, Straight, Boot, Chino, Cargo etc. Its best you stick to your regular style jeans, the common fit that works for most is a straight leg. The cut of motorcycle jeans are slightly different to normal jeans. Make sure the front & back rise is not too low, otherwise they will be very uncomfortable when sitting on the bike and your backside won’t be covered. Make sure they don’t sit too high because it will put pressure on your abdomen & make it difficult to swing your leg over the seat. Its important the pants fit neat so the material especially the ankle doesn't flap in the wind. Ensure enough room for comfort when sitting on the bike to reduce fatigue & discomfort, eg pressure point behind leg. If the pants are too loose in the thighs/knees/shins they will most likely twist and cause injury. The video views Kevlar fabrics in more detail, showing the difference between woven/interlock & knitted Kevlar aswell as the weights you may see from various brands. 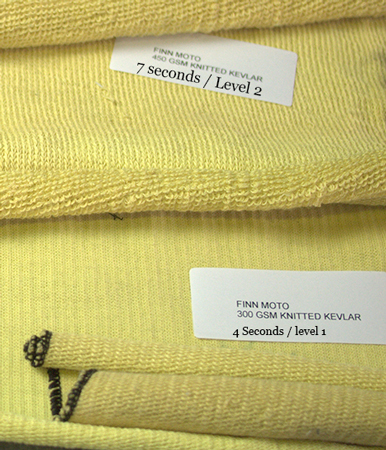 Independent tests (en-13595 impact abrasion test) has shown Finn Moto's 300+gsm knitted Kevlar meets level 1 abrasion protection (uk/europe standard). The purpose of the video is to show you what Finn Moto Kevlar looks like with side by side comparisons of other brands Kevlar. Its important you buy from brands that can actually prove how protective the motorcycle wear is. For example "Kevlar lined" is not enough information. Brands that offer detailed item specification &/or independent abrasion tests results preferably UK SATRA's EN-13595 Impact Abrasion Test are the ideal choice. Saying that the video will show you two Kevlar hoodies with almost identical protective fabric description, yet the differences between the Kevlar fabrics are massive. Hopefully this guide & video will help you find the right motorcycle Kevlar jeans for you whilst still ensuring you get what is advertised & most importantly protected. Level 2 - is designed for high way speeds. A study revealed 75% of all motorcycle crashes/accidents are at 60kph or less.